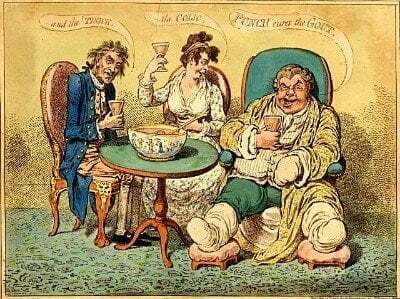 I use gout myths to help explain what gout is by providing the facts about what it is not. In the first article, I explained how the correct treatment for gout is to reduce uric acid. But, gout is not a disease that can be treated by a standard dose. 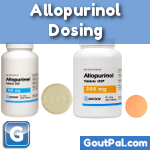 Allopurinol is an extremely common and inexpensive way to lower uric acid. Unfortunately, there is a very common myth that 300mg allopurinol will bring gout under control. Whilst 300mg may be effective in many cases, it is not effective for all gout patients, and in rare, but extreme, cases it may be dangerous. Why Is 300mg Allopurinol Prescribed? Though pain relief is important, the only way to permanently fix gout is to lower uric acid until all uric acid deposits have been dissolved. There are many ways to lower uric acid, including several drugs, alternative treatments, and diet. Combinations are often effective, so gout diet improvements with low-dose gout medications might suit you. It is best to discuss your options with your doctor as soon as you are diagnosed with gout. Uric acid monitoring is vital. You must get it down to 5mg/dL (0.30mmol/L) as soon as you can. As uric acid crystals dissolve faster at lower uric acid concentration, it is a good idea to aim as low as possible for around six to twelve months. The length of time will vary according to how long you have had gout and its severity. Once you have gone six months without a gout flare, you can slowly relax your uric acid lowering treatment. You reduce allopurinol dose slowly to maintain no higher than 5mg/dL (0.30mmol/L) for the rest of your life. In many cases, treatment can be relaxed completely for a few months, but you should always keep checking uric acid levels. What Is wrong with 300mg Allopurinol? As the most common gout treatment, allopurinol is surprisingly misunderstood – often by doctors who should know better. There is no such thing as a standard dose. Yet, many doctors simply prescribe 300mg allopurinol per day and leave the patient to manage themselves. Initial long-term treatment of recurrent uncomplicated gout normally should be with allopurinol. Start with a dose of 50–100mg. Increase by 50–100mg increments every two weeks, adjusted if necessary for kidney function (see further), until the therapeutic target is reached (maximum dose 900mg). Therapeutic target is uric acid in the blood less than 5mg/dL [0.30mmol/L]. I prefer to refine this procedure. I include an intensive uric acid dissolving period as I described above. Whether you do this or not, the dosage is clearly not a standard 300mg. Dose must vary from person to person according to their exact needs. It may also vary from time to time, as your body ages, or if you change your lifestyle. Regular testing is vital at least once per year, and more frequently whenever you change dose. What Are Gout Dangers From 300mg Allopurinol? Allopurinol is generally well tolerated. However, there are a very small number of people who are allergic to it. Severe allergy might lead to Allopurinol Hypersensitivity Syndrome (AHS). This is a very dangerous condition. AHS might be controlled by drastically lowering the dose then increment in very small steps. However, it can prove fatal, therefore it is wise to start with a 100mg dose to ensure that you can tolerate it. In Fatal allopurinol hypersensitivity syndrome after treatment of asymptomatic hyperuricemia, Alfonso Gutiérrez-Macías and colleagues report the death of a gout patient taking 300mg allopurinol daily. There are many similar reports which I am currently researching to review dosages that are acceptable or potentially problematic. Though the effects of Allopurinol Hypersensitivity Syndrome are severe, they are very rare. On a personal note, I am currently taking the maximum 900mg dose with absolutely no side-effects. I recommend that you focus on the benefits of lowering uric acid quickly and effectively. You must discuss any fears about side-effects with your doctor. Is 300mg Allopurinol right for you? Allopurinol 300mg might be the right dose for you. But how do you know if you are not tested properly? You need to go through the right procedure to make sure you get the dose that is right for you. Start with 100 mg and test after 4 weeks. Increment by 100mg every 4 weeks after testing to get uric acid down to 2 to 3 mg/dL (approximately 0.1 to 0.2 mmol/L). Maintain low level until you go 6 months without a gout attack. Relax the dose by 100mg every 4 weeks after testing to maintain uric acid at 5mg/dL (0.30mmol/L). Test at least once per year. If dose change is necessary, test every 4 weeks until uric acid level is stable. I’m preparing a practical guide to allopurinol treatment. In the meantime, if you need help planning your allopurinol treatment properly, please ask in the gout forums. Leave 300mg allopurinol to browse the Allopurinol guidelines. Related Gout Facts: Allopurinol Dosage, Gout Myths, What Is Gout?